Beckley’s is a premier dealer for Western snow plow and salt spreader serving the Frederick area. Beckley’s offers Western snow plows and salt spreaders for homeowners and commercial property managers in Frederick, Maryland (MD). From personal-use and light municipal snow removal operations to commercial snow plowing, Western and Beckley’s work together to prepare you for the harsh winters that can (and do!) hit Frederick. Learn more about our selection of snow plows and salt spreaders or call us today at 800-301-4787 for a free quote! Don't forget your Western Maintenance Accessories! When it's timme to conquer the drifts in your driveway, the DEFENDER™ compact snow plow can help you clean up like a pro from the comfort of your own vehicle. Just hook it up to your mid-size pickup or SUV and plow your property how you want, when you want! 6' 8" 23 1/2" 16 2 6 5' 11" 290 lb optional 1/4" x 5"
7' 2" 23 1/2" 16 2 6 6' 4 1/2" 297 lb optional 1/4" x 5"
When winter’s coming on strong, you need a plow that’s going to give you some real pushback. The WESTERN® MIDWEIGHT™ snow plow is lean, nimble and provides plenty of muscle. Big performance for light commercial use. Going half way has never been your style. With the WESTERN® PRO PLUS®, there’s no holding back. It’s rugged, tough and built to take even the most punishing applications. The PRO PLUS – go all the way. Get an 8’ blade, a 10’ blade, an 8’10” scoop/pusher blade or a windrowing machine all at the touch of a button. The WESTERN® WIDE-OUT™ adjustable-wing snow plow hydraulically transforms to move more snow, no matter what the condition. Up to 30% more. It’s the ultimate in CONTRACTOR GRADE® performance. Here’s to matching the equipment to the job! With the largest blade available from WESTERN®, the 10’ wide HEAVYWEIGHT snow plow is made for trucks in the 14,000-27,000 GVW range. You can count on these plows for light municipal plowing applications like local streets, parks, county roads, parking lots and more. When it’s 5:00 a.m. and you’ve still got three more lots to plow, you’ll appreciate the speed and efficiency of an MVP PLUS™. Easy to Operate as a Straight-Blade. The all-new PRODIGY™ snow plow features an ingenious patented mechanical wing design that automatically positions its wings to deliver maximum plowing efficiency. Whether in straight-ahead scoop mode or angled for windrowing, it delivers multi-position winged plow productivity in a plow that’s as easy to operate as a straight blade. It’s available for trucks or skid-steer loaders. The WESTERN® PRO PLUS® and new PRODIGY™ snow plows are available with a universal skid-steer loader mounting plate for fast and easy hook-up. The skid-steer’s standard auxiliary hydraulic system provides the power to operate the blade. The WESTERN® IMPACT™ UTV snow plow is a professional-grade v-plow designed and built exclusively for utility vehicles. This tough, 6' wide v-plow easily adapts to handle 5' sidewalks and gates in angle, scoop or V mode. Now you can have year-round UTV fun and get your winter work done too. For CONTRACTOR GRADE® ice control performance, the Tornado Spreader is unstoppable. Its rugged one-piece poly construction is built to last, and the innovative design features are made for performance, so your ice control jobs get done faster, every time. 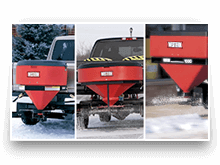 Available in three sizes, there’s a Tornado Sand and Salt Spreader just right for your snow and ice control contracting business. An innovative chute design delivers material to precise points on the 15 ½” poly spinner to cast it out and away from your truck, while the unique circular deflector shutter offers one-sided deployment, providing more targeted, more profitable spreading. Constructed for supreme durability and loaded with the latest in snow and ice control technology. For precise ice control performance, turn to the powerfully versatile PRO-FLO™ 525 and PRO-FLO™ 900 Tailgate Spreaders. A 2-stage, auger-fed delivery system and independent variable speed control provide consistent and efficient flow of all types of de-icing materials, including rock salt and sand. Designed to attach to a wide variety of vehicles, it’s versatile enough for any job site or surface condition. 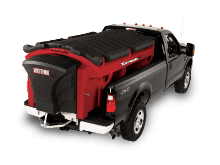 When you need a smooth functioning tailgate spreader and an unobstructed view from the cab, you need a WESTERN® Low Profile Tailgate Spreader. Whether you choose the Model 500, 1000 or 2500, all three spreaders are ideal for spreading #1 rock salt, calcium chloride and other de-icing materials. Choose between in-cab “on/off” control, or variable speed control option, for all three tailgate spreader models. Mount up and get going! The WESTERN® LOW-PRO 300W wireless electric tailgate spreader delivers the ultimate in “plug ‘n’ play” convenience. Easy to mount on many vehicles without drilling or wiring, the LOW-PRO 300W tailgate spreader comes with a standard 2" receiver hitch and a 7-pin plug, and a completely wireless key fob control! Available with mounts to fit pickup trucks, SUVs, utility vehicles and tractors. Electric Motor 2 ½" x 5 ¾"
Have limited spreading needs, but still want to get the job done right? 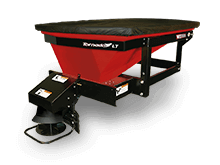 The WESTERN® Tornado™ UTV 1/2 Cubic Yard Poly Hopper Spreader provides professional spreader performance in a compact package that is perfect for smaller area spreading needs. The Tornado UTV Hopper Spreader is designed to spread a 50/50 sand/salt mix or bulk salt. Installed in the bed of a UTV, the Tornado UTV Hopper Spreader is designed and built to provide top spreading performance. Whether you’re drop spreading along narrow walkways, or broadcast-spreading across wider areas, WESTERN® Professional Walk-Behind Spreaders will get the job done. Constructed of sturdy corrosion-free polyethylene, both walk-behind spreader models feature a clear hopper cover to keep your de-icing material dry and flowing freely while providing a clear view inside, so you know when it’s time to reload. With pneumatic tires and a powder-coated steel frame, these salt spreaders also handle commercial ice-melt products, and are designed to provide trouble-free performance. Apply liquid anti-icing before the storm to help prevent snow and ice from forming a bond with the pavement, so it's easier to scrape clean down to the surface. The SS-120 walk-behind sidewalk sprayer helps you do just that. Spray anti-icing liquid before the storm and your sidewalks will come out cleaner than ever! Getting the job done right means using the right tool for the job. The WESTERN® RB-400 walk-behind rotary broom is a combination sweeper/snow plow that scrapes and sweeps the surface clean along buildings, curbs, and edging on just about any paved surface. 72" x 40" x 42 1/2"
80" x 40" x 42 1/2" Up to 2.7 mph 3 1 Yes 7 Position Honda® 4.5 hp Polar Trec Snow Tires Wide: 40"
For your snow and ice removal needs, we carry a full line of durable and dependable Western Snowplows. Learn more about each individual product below! At Beckley’s, we are committed to providing you with the highest quality equipment, parts, and service for your snow removal equipment needs. Here at Beckley’s, we work with you and make sure you are fully knowledgeable on how to operate your snow removal equipment before you leave. We install, test your plow or spreader, and align your plow lights to make sure your snow removal experience is the best it can be! If you’re looking to buy a Western snow plow or salt spreader and are located in the Frederick area, call Beckley’s today or contact us online. We are open through the week from 9 a.m. – 6 p.m. and Saturday 9 a.m. – 4 p.m. with professionals on site, that are fully knowledgeable in Western products sales, parts, and service. Beckley’s wants you to be prepared for winter with the best of the best—and that means snow plows from leader manufacturer, Western! We are fully stocked with Western snow plows and salt spreaders year round, so stop by and visit our location at Beckley’s RV Rentals in Frederick, Maryland (serving 21701, 21702, 21703, 21704, 21705, and 21709) or give us a call at 800-724-6692 to check out our selection! Free quotes are available on site, by email, or over the phone!